The Chamber Orchestra of the Triangle gave a splendid concert yesterday in the Fletcher Hall of Durham’s Carolina Theatre. The program, “Romantic European Riches,” was well-chosen, with the first half featuring three works with different kinds of romanticism. The second portion was given over to Felix Mendelssohn’s Violin Concerto in e minor, op. 64, for which the orchestra was joined by the delightful and dazzling guest artist Paul Huang on violin. With Lorenzo Muti on the podium and first violinist and concertmistress Claudia Warburg returned from an absence due to injury, the orchestra seemed particularly happy to be playing as they opened with a buoyant rendition of Die Fledermaus Overture, op 362, by Johann Strauss, Jr. The Overture is a fast-moving medley of tunes and motifs heard in the comic operetta from 1875–it is bright and gaudy and not a bit serious, and every little while the 8-minute work spins you smilingly around in waltz time. The mood was varied by the interesting piece that followed, Piccola Musica Notturna (based on a a poem by Antonio Machado), by Italian composer Luigi Dallapiccola (1904-1975). Dallapiccola was influenced by the 12-tone composers of the Second Viennese School (Schoenberg, et. al.) but his Italianate rendering of that intellectual style is imagistic and sometimes melodic. The orchestra played the composition beautifully, skillfully rendering the poem’s shifting emotional tone with a rich aural palette. The violas sounded particularly fine, as did the intermittent notes from the plangent harp. Next came the explosively vital Carnival Overture, op. 92 by Antonin Dvorak, which is not actually an overture but a brief work complete in itself, though one of a cycle of “overtures” on nature, love and life. It is sonata-like in form, and its three sections allow us to observe the clamorous Carnival crowd; to back off and reconsider all this joyous frenzy; and finally to plunge in with shining spirit. It’s a very exciting piece, and the orchestra played with an intoxicating combination of precision and abandon. Paul Huang. Photo: Lisa-Marie Mazzucco. After intermission, guest artist Paul Huang joined the orchestra for what turned out to be an absolutely gorgeous interpretation of the Mendelssohn Violin Concerto in e minor, op. 64. The 22-year-old Taiwanese-American has not only technical prowess, but an eloquence of tone and phrasing that indicate a delicacy of mind. Whether he was playing the 1683 Nicolo Amati violin mentioned in the program, or the 1742 Guarneri mentioned on his website, the instrument had the most beautiful sound, and Huang’s silken bowing drew out long pure notes in the lively music. It was a great pleasure to watch the close interaction between Huang and Maestro Muti, and to witness the orchestra’s ability to support and surround the soloist. Music like this truly is the food of love, as was borne out by the spontaneous bear hug by Huang and Muti at its conclusion. 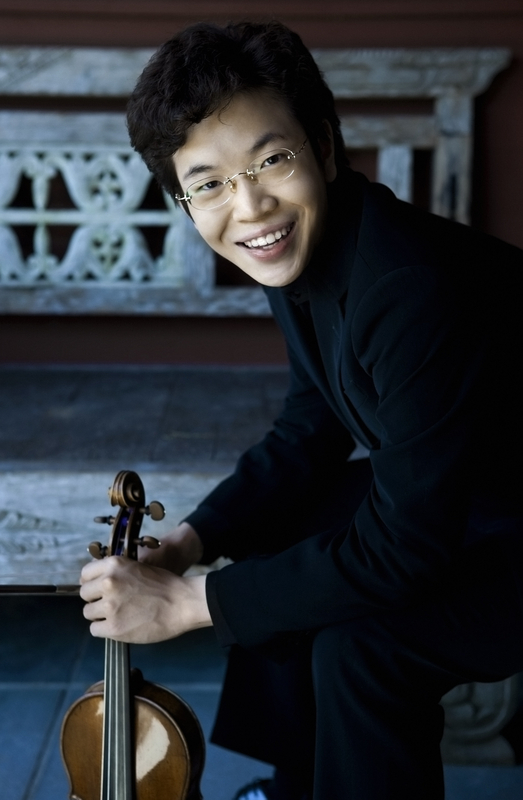 Huang was in Durham as part of the COT’s Young Soloists program, which brings soon-to-be-stars to the Carolina. (The January program included a ravishing performance of Beethoven’s Piano Concerto no. 3 in c minor, op. 37, by Andrew Tyson.) Huang barely made it, due to the domino chain of flights canceled and rebooked because of the snow. He had arrived in time for just one rehearsal with the orchestra and conductor, which made the performances of one and all even more remarkable. Sadly, but not surprisingly, the airline involved had refused to rebook Huang in time to perform–the COT was forced to buy a new high-priced ticket to get him here. If you appreciate this aspect of the COT’s programming, it would be a fine time to send a few extra dollars their way. In fact, COT president David Lindquist says that individual giving is lagging this year and that “we are skating perilously close to the red this season.” If you can give to this fine community orchestra, it will help keep these fabulous concerts happening for a mere $20 a ticket. The COT needs general operating support, of course, but there are also interest specific endowments, such as the one honoring the late Robert Ward, which will support the playing of 20th and 21st music. The COT’s next concert will take place March 22 and 23, when they collaborate with the Concert Singers of Cary on Arthur Honegger’s Le Roi David, with libretto by Rene Morax. This season will wind up May 11 with a program that will include guest artist Louis Schwizgebel-Wang playing Beethoven’s Piano Concerto no. 2.